No one has a little fender bender with a tractor-trailer or semi truck. The sheer size and velocity of these vehicles usually precludes the possibility of “minor” crash  especially when involving carelessness, recklessness, or negligence on the part of the driver or trucking company. Trucking accidents caused by the negligent operation of large trucks on California roads results in thousands of catastrophic personal injuries and wrongful deaths each year, leaving families struggling to cope both emotionally, physically and financially. If a semi tractor-trailer crash has touched your family, contact one of the personal injury attorneys at the Golden Gate Law Group. 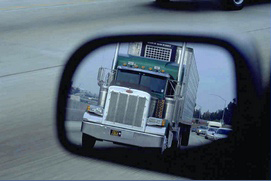 Determining liability of the trucking accident will be of vital importance to your legal claim. Our truck-car accident law firm has over 35 years experience providing exclusive personal injury representation for California families; not just in the San Francisco Bay Area, but in Los Angeles and San Diego, too. We have several law offices located throughout the state to best serve our clients. Call us now for Free Consultation at 1-800–704-0151. If you have been injured or have had a loved one killed after a negligent accident involving a big rig accident or semi tractor trailer crash, you will need the best legal representation and medical care available. Compare our results and then contact a San Francisco Bay Area truck accident lawyer at Golden Gate Law Group today for a free consultation and ensure the steadfast protection of your legal rights.